Publisher(s): Nintendo of America Inc.
One thing I always find funny about Nintendo is their ability to make things instantly more attractive to skeptical gamers than adding Mario. “Hey, can we interest you in this puzzle game where you drop pills onto viruses?” “No.” “What if Mario’s the doctor?” “SOLD!” It works every time. In my case, I don’t care for tennis, but I thoroughly enjoyed Mario Tennis. 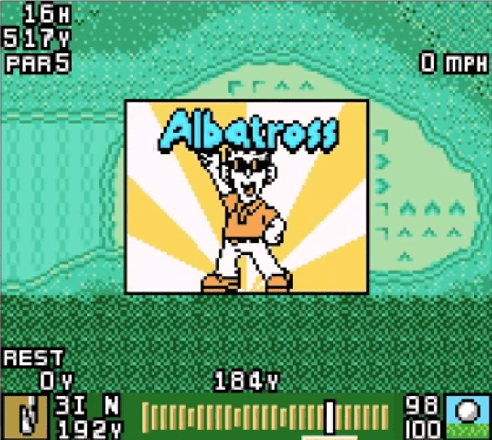 Now, we’re fudging a little bit here, because I actually do like golf, but I’m well aware not everyone else does, so we get to test the Just Add Mario theory with today’s game, 1999’s Mario Golf, a Game Boy Color exclusive! Well, I must admit, that intro is a wee bit misleading, as even though the game is called Mario Golf, there’s really not that much Mario or any of the other canon characters to be found here. The real hook of the game, to me, is the layer of RPG elements injected into a golf title. Y’see, the main single-player mode of the game is a quest where you take one of four generic characters and try to become the world’s greatest golfer, a title currently held by, who else, Mario. There are four regular courses to conquer, each with their own Club Tournaments and Club Champions to dethrone, Putts, Grace, Tiny, and Gene Yuss (I see what they did there). As you play rounds and perform well in tournaments, you gain experience and level up, allowing you to upgrade attributes like drive distance, contact area, which decides how much leeway you have with accuracy, and adjusting your shot’s fade or draw. Granted, this may not sound like a big deal now, but even in 1999, there weren’t a lot of sports games, especially golf games, that allowed you to build your player up and increase their abilities over time. 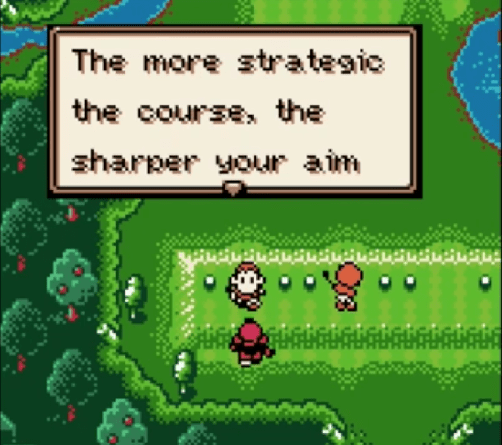 Aside from just putting in rounds, there are a handful of side challenges that you’ll find along the trails between courses that can net you some experience points, as well as teach you some useful techniques to add to your game, like how to compensate for crosswinds on your approach or how to hit a knockdown shot to get out from behind a tree. The courses themselves also have a few contests as well, like the putting challenge which asks you to get a certain number of putts inside a circle near the hole. If you’re diligent, you can even get the attention of a master clubmaker who hook you up with enhanced clubs for longer distance or superior control, so it pays to nose around instead of just booking from course to course. You really want to drop in close to the hole here. The gameplay here is quite solid. Mario Golf uses the standard three-click system for your shot; press A once to start the meter, press it again for your power, and a third time when it gets back to the sweet spot for maximum accuracy. If you press B before swinging, you can attempt a Power Shot, of which you have a limited amount. 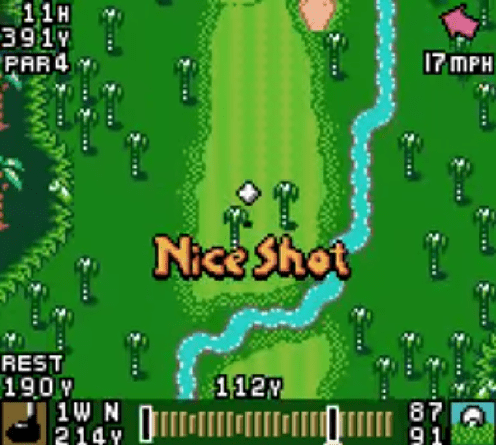 However, if you get the timing perfect, you won’t lose a Power Shot, so if you’re getting into a groove with the shot meter, you can really start to just grip it and rip it, allowing you to do things like reach the green in two strokes on a par 5 and blowing the courses wide open. You can add spin to your shot to try to fade or draw around obstacles or get the ball to stop quicker on the green, which can be very useful if you’re aiming for a narrow spot. The putting is also pretty well done here, there are little arrow shapes on the green that dictate the direction and severity of slopes on the surface, and with a little practice, you can consistently learn to read greens and convert birdie opportunities regularly. As I said, your ultimate goal is to dethrone each of the club champions in Match Play. I suppose that each of the four are supposed to specialize in a particular aspect of the game, but I could only really notice it about Tiny (who bombs Power Shots all over the place and can be frustrating because of his enormous range) and Gene Yuss (who is basically just the AI difficulty cranked up to 11), and didn’t notice anything particularly gimmicky about Grace or Putts. However, you would be well advised to try to put your opponents away as quickly as possible, as for some reason, once you hit the back nine, you’ll notice that get a LOT better out of nowhere (to the point where when I played against Gene Yuss, he holed out multiple times from over a hundred yards away). I suppose it makes sense to build up some drama to the matches down the stretch, but it definitely borders on cheap. And speaking of less-than-on-the-level tactics, after you conquer the four reigning club champions, you’ll unlock the final course, which in no way resembles anything an actual architect would design and is a collection of insane holes that would almost be better suited on a game like Wicked 18. I’d say it’s a love-hate relationship, but hey, it’s your game. Mario Golf was, I believe, one of the first exclusive titles for Game Boy Color, so Nintendo obviously took a lot of effort into making sure it looked great for a handheld system (of course, on the flip side of the coin, it’s a little disappointing that they didn’t program in a way for this to be compatible with regular Game Boy or even Super Game Boy). 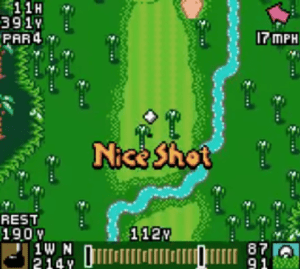 The courses look especially vivid, from the lush greens and bright blue waters of the Palm Club to the imposing sandy wastes surrounding the Dune Club, the animation is solid, like the celebration/disappointment reaction after a character finishes a hole, and as you tromp around the overworld to get from place to place, the character sprites you encounter are rather reminiscent of the style seen in the early Pokemon games. Each course has its own separate background music, and while they’re not full-on classics, they’re pleasant enough that you won’t be annoyed that you’ll be hearing them so often. The sound effects are a delight, especially the rip of hitting a perfectly timed power shot or the sploosh of landing your ball in the drink…which hopefully, you won’t have to hear very often. 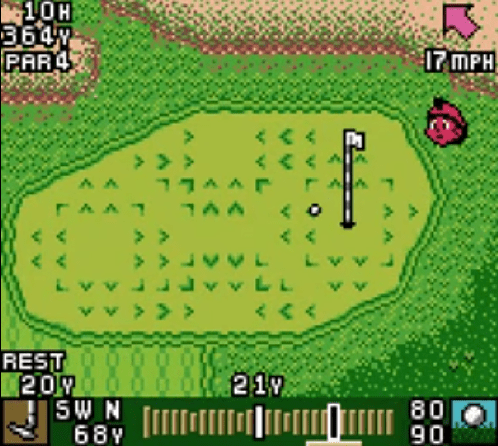 Mario Golf is an excellent little game that does exceedingly well at its two purposes: being a quality golf game and showcasing the strengths of the Game Boy Color itself. As far as the golf end of things is concerned, the mechanics are solid, the courses are (mostly) the right balance between challenging and “I can crack 60 if I get hot”, and you have a pretty decent range of shots and other options to futz about with. The main mode is surprisingly engrossing, as adding just a simple concept like experience points and improving your character over time always gives you something to do, and the side challenges teach you useful things to incorporate on the links themselves. On the presentation side, there’s certainly a lot of that famous Nintendo craftsmanship here; even limited by the constraints of a handheld system, there’s plenty of character in the visuals and the music and sounds are high-quality. 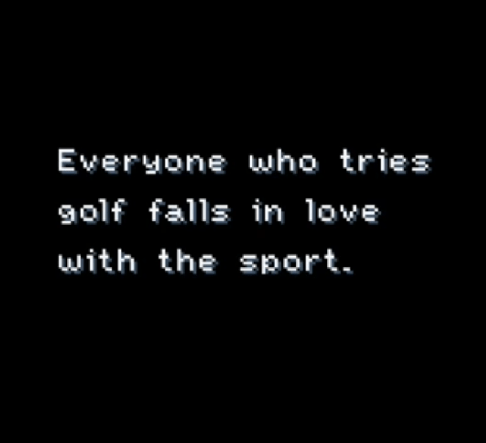 I’d definitely recommend Mario Golf if you’re looking for a quality golf game, even if you’re not much of a golf fan, just be advised, you’re not gonna be seeing much of the titular character here. The splash of RPG-esque character development adds a good bit, solid gameplay mechanics and the always welcome Nintendo Touch. There’s really not much here to suggest this has anything to do with Mario a’tall, and the Match Play showdowns can get artificially difficult down the stretch. Enjoyed your review. 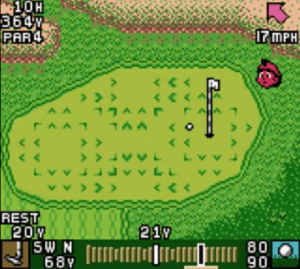 One of the greatest games on the GBC and a fantastic first golf game and tutor to boot. 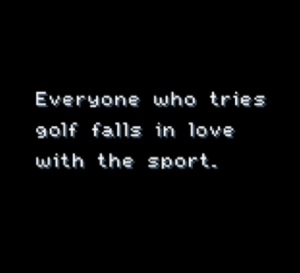 Seriously, this game taught me more about golf than Tiger Wood’s PGA games! Ah so love it! It’s Top Dog!